Which MBA Program is right for me? The following events are open to UConn graduate business students. 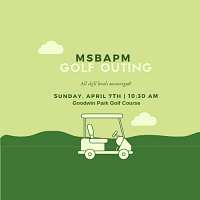 You are cordially invited to join fellow MSBAPM alumni, current students, faculty, and staff from the program for a golf outing followed by a casual networking luncheon. It is extremely important that prospective students make informed choices regarding the selection of a graduate program, and attending an infosession is a valuable way to gather the missing pieces. UConn's graduate business infosessions are an ideal opportunity to learn first-hand about our highly ranked programs, meet with admissions representatives and hear from some of our faculty members. It's also a great way to get acquainted with the campus and see where you would be attending classes. Infosessions at our Waterbury campus present information on the Part-time MBA Program. Check out the following quick links to learn more before coming to an event.